Parents all over the country are concerned about to what extent swimming pools are safe for their kids and the potential dangers of drowning. Other concerns that have surfaced here in Florida also involve the levels of chlorine present in pools and even recent warnings issued by health officials describing dangerous parasites and the infections that they can cause. In addition, here in Florida, one of the biggest concerns in general with swimming pool incidents has to do with how frequently alligators are found in them. So which one of these concerns should be prioritized, and should we simply keep our kids out of the water this summer to avoid all of these threats? We discuss these concerns in more detail below, including some of the legal repercussions they may or may not include. Alligators: Everyone who lives in Florida knows that we have our fair share of encounters with them. In the summertime, those encounters can increase, particularly for families that have swimming pools in their backyards, as one family recently found out on Memorial Day. Luckily, they took a look at the pool before the kids ran out and got in, but what if they hadn’t? Although sometimes these alligators wander in from nearby creeks, sometimes they also originate as escaped pets. If someone else’s pet has escaped and endangered you or your children, there are some circumstances under which you can pursue a legal claim against the pet’s owner for negligence. 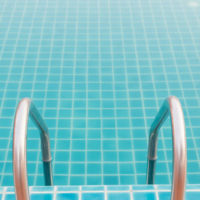 In early June, health officials issued an official warning for the public to take precautions both in swimming pools and water playgrounds due to the risks associated a parasite that’s easy to spread; Cryptosporidiosis (Crypto), a parasitic infection that can occur when people come into contact with objects or water contaminated with diarrhea (which includes chlorinated swimming pools). Once someone comes into contact with it, it can not only last up to 10 days, but it can spread throughout households and childcare facilities, causing people to be sick with severe diarrhea, stomach cramps, nausea, vomiting, fever, and dehydration. Because the parasite cannot be killed by chlorine, it is imperative that swimming pool facilities mandate very specific hygiene protocols and some level of diligence to ensure that anyone who is ill does not enter the pool. Failing to do so could not only result in a very sick community, but also potential negligence claims. What about the Chlorine Levels? According to the experts, it’s not so much the pool chemicals themselves that you need to worry about, but how they mix with other chemicals that people will sometimes bring into the water, such as body care products, and even urine. The resulting molecules are dangerous to both the eyes and the respiratory system, and may cause cancer; yet the real danger is: we don’t know a lot about them because they haven’t exactly been studied. Once again, this is all the more reason for swimming pool facilities to be proactive in strictly limiting what visitors bring into the pool in order to help ensure that all visitors are protected. If improper supervision, negligence, and/or improper safety precautions have hurt any of your loved ones, we are here to help. Friedland & Associates represents families who have suffered and/or lost a loved one due to swimming pool accidents. Contact us today for a free consultation to discuss your potential case.